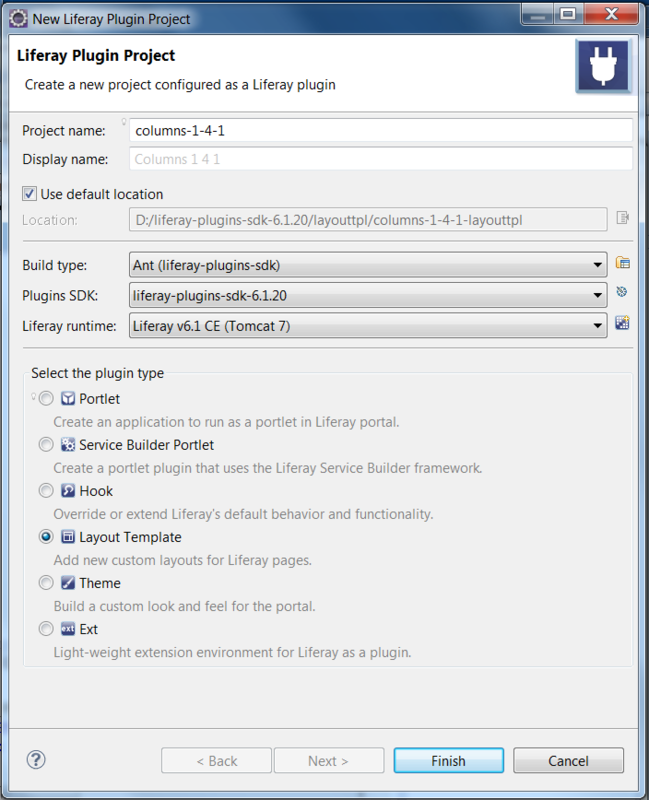 With the Plugins SDK you can deploy layout templates as plugins, and creating layout templates with Liferay Developer Studio is easier than ever. Let’s call our layout template called Columns 1 4 1. Enter columns-1-4-1 for the Project name and Columns 1 4 1 for the Display name. Choose whichever build type you prefer (Ant or Maven) and select the appropriate Plugins SDK and Liferay runtime. ./create. [sh|bat] <project-name> "<layout template title>"
./create.sh columns-1-4-1 "Columns 1 4 1"
create.bat columns-1-4-1 "Columns 1 4 1"
Developer Studio’s New Project wizard and the create scripts generate layout template projects in your Plugin SDK’s layouttpl folder. Layout template project names must end with -layouttpl so when you enter columns-1-4-1 for the project name, -layouttpl is automatically appended to the project name.